see those dots on the horizon there ? At the end of November, we set off on a 10 day "expedition cruise" operated by Oceanwide Expeditions, branded as "Search for the Emperor Penguin". 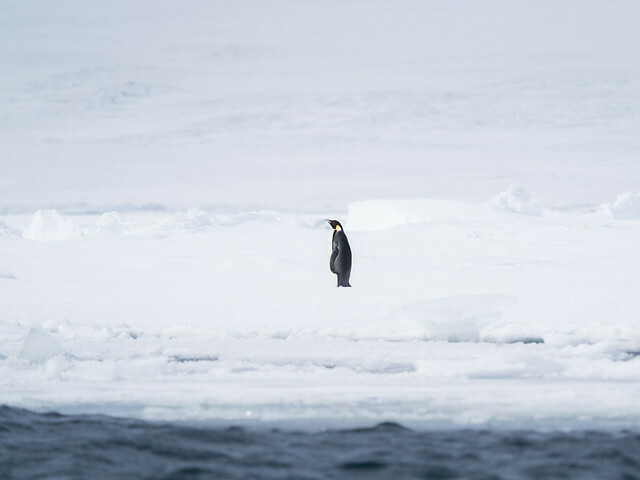 The cruise, aboard the M/V Ortelius, was to head into the northernmost region of the Weddell Sea, and hopefully reach Snow Hill Island, where a number of Emperor penguin colonies had been discovered some years previously. Snow Hill Island is actually well out of what was usually understood as the range of the Emperor, being well North of the Antarctic Circle. The colony had been reached twice before by tourist operations, several times by the icebreaker Kapitan Khlebnikov chartered by Quark Expeditions, and once by Ortelius itself in 2013. Ortelius is quite an unusual Antarctic cruise ship in that it has a helideck and hangar, and enough space for 2 to 3 helicopters. In this case, 2 were carried. The ideal situation would be that the ship would be able to get close enough to Snow Hill island to be able to use the helicopters to ferry passengers to a location on the sea ice at least 2km distant from the colonies, from where they would be reached on foot. This is a pretty ambitious plan - with a lot to go wrong. It appeared than a significant proportion of the passengers did not really realise quite how ambitious it actually was, and how low the chances of success were. In the past years, very few of the conditions had been met. Up until 2016 Oceanwide had 4 attempts at carrying this through, with a success rate of just 1 actual landing (if I understand correctly). This time round, absolutely everything worked out fine ... except for the last point. The Ortelius encountered open water for almost all of Admiralty Sound, but the remaining sea ice, where the colonies are located, turned out to be in very poor state. In several areas there were surface pools, along with areas which looked recently refrozen, and there were many rifts and cracks. A little to the south there was open water into the Weddell Sea, as far as the eye could see. Possibly it might have been feasible for experienced sea ice travellers to make a safe traverse, but no way could 110 blundering tourists be unloaded. Furthermore the helicopter crews did not feel that the ice would reliably support the weight of a helicopter. M/V Ortelius up against the sea ice west of Snow Hill island, with Lockyer Island in the background. So, sadly, that was that. There were a lot of very unhappy punters on board, but while it was natural to be disappointed, a lot of people seemed to think they were on a day trip to Disneyland or something. Antarctic operations, especially tourist cruises, need to take a very conservative approach to safety. Anything that goes wrong would very likely go wrong very badly. There was perhaps a significant lack of timely information and explanation provided by the staff, which didn't help the atmosphere, but that in itself changed nothing so far as conditions were concerned. Everybody did at least get an overflight of the colonies, and spotted a few solitary emperors on sea ice near to the ship. These in themselves are experiences that very few people have had, but these days it seems that expectations run ridiculously high. The desire to grab photographic trophies to post on Facebook or wherever blinds people from the richness of actual experiences. Emperor penguin colony from the air (the dots on the right). Being British (well, sort of), I obeyed the rules and didn't take a telephoto lens in the helicopter. As it turned out, the colonies appeared to be thriving. As I understand it, we expected to find 3, in fact there were 5. I'm not sure how much longer this will be the case though. By the look of things the sea ice is very vulnerable. Very strong currents run through Admiralty Sound between Snow Hill and James Ross Island, which I assume are driven by the Weddell Sea gyre, and if there is a complete breakup in a summer season, it is hard to see how it will recover. Multiyear ice seems to be very sparse. 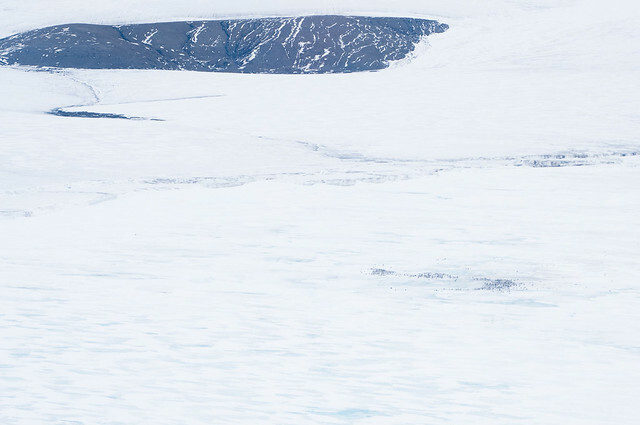 The breakup of the Larsen A & B ice shelves in the same region has been partly blamed on rising surface water temperatures, so the outlook cannot be good. With no sea ice there will be no penguins. The standard price of this trip is, for the lowest standard two berth cabin we had, $13K per person. Fortunately we got an extremely reduced offer, or I would not be writing this. I get a reasonable salary, but $13K for a 10 day trip is way beyond reality, never mind pain threshold. Oceanwide expeditions is a good company, and they are quite open about the chances of success - meaning physically reaching the emperor colonies - but unless it is something you really, really want to do, and are prepared to take a big gamble, there are much better Antarctic cruises on offer at very significantly lower prices, including with Oceanwide. Helicopters don't come cheap.